On 17 November we attended the conference of Jared Diamond at the Economics faculty. He is a well-known American evolutionary biologist, physiologist and geographer, who has worked in a lot of universities (Cambridge, UCLA…). The man spoke for half an hour about the reasons why past and present societies succeed or fail when they have to cope with problems. After having exemplified what he said, he added we had to learn from the past. He meant that we had to pay attention to environmental problems and the attitude of the wealthy classes. Moreover he focused on the fact that the world today is more dangerous than he has ever been. Now we have to take the best decision to minimise the risk of a global collapse. When I sent the email to book a seat for the conference, I did not know what I was going to attend. In fact I am not really accustomed to conferences. Yet, I thought it would be an interesting hour during which I would learn new things concerning the changes of the world. This was not the case at all. Everything that was being said was already known by everyone except the first part of the speech during which mister Diamond talked about the civilizations of the past. All the rest was only the enumeration of problems that the world knows nowadays. I do not really understand why Jared Diamond is so famous because of his writings. He never gives us clear explanations about phenomena. At the end, there was a ‘question time’ and this part of the conference confirms what I just said. There were very interesting questions that were being asked to him, but these questions were not easy to answer. For example, somebody asked “Africa suffers a lot because of the lack of water, however it is the continent that respects the most this resource. When is Europe going to realize that it is absolutely necessary to spare more water?” The answer was “When the Europeans will encounter the same problems as the Africans!” and there is no need to be a seer to be able to give this answer. The fact is not that I hated this conference, but more that I did not learn anything new. Positive aspects were that it was great to hear a perfect American pronunciation and also that the first man who talked to introduce Jared Diamond made us laugh a lot. He had a very bad English accent, I had never heard that before. As a way of introduction to this lecture, the audience heard a brief speech from the vice rector of the University of Namur. Unfortunately it was not really structured, too long as well as very badly pronounced. Therefore, we got a quite negative impression about the conference from the beginning. As far as the conference in itself is concerned, I feel, however, much more satisfied. 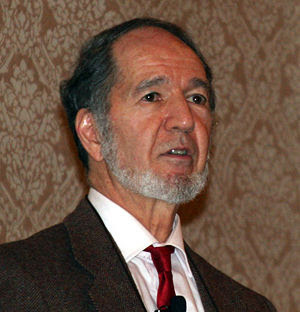 The speech of Jared Diamond was clear and understandable despite his American accent. He mainly dealt with current ecological changes and with the way societies can respond to them. That is why it was interesting, even for inexperienced people. This issue concerns all of us and cannot leave insensible. However, it seems to me that he did not really bring something new or unknown to the issue. In this sense, it was a bit disappointing. Besides, many questions were asked to him in this respect and he gave no real answer. I must admit that I didn’t know exactly what the conference will be about before entering the room. Hopefully, thanks to the notes given at the entry I had a clearer idea of the subject. Jared Diamond was also really clear in his ideas and managed to draw the spectators’ attention from the beginning until the end of the conference thanks to his humour, speech tone and subject. His speech was indeed full of anecdotes about his wife. His speech tone varied and was not at all monotonous. Finally his subject was interesting and new. It is indeed different from what we usually hear and still interesting for our kind of studies. We also speak a lot about the civilisations in our studies and it was nice to hear about it from another point of view. It was very interesting to listen to Mr Diamond. He was keen on his topic, which dealt with how civilizations have coped with change since the Antiquity. He spoke on a spontaneous, passionate way and his pronunciation was easy to understand. It was unluckily not the case of the people who spoke before he did. This man has shown that his job can represent more than a salary, it is a passion. Now I am curious to put an eye on one of his books. Mr Diamond also answered a lot of questions but I have one more remaining: why did we receive such a thick hand-out with things which were not told during the conference? The Economy Faculty invited an American speaker to give a conference on issues which are part of everybody’s life, that is to say, the adaptation of a number of societies or the failure of others when they have to face challenges such as environmental problems. Such a conference is quite a big event for a small university like Namur and requires a whole organisation. Jared Diamond was first introduced by the vice-president of the university, whose English was really awful. Most students were ashamed of such a welcome speech. The subject of the conference seemed to be attractive. Indeed, there were no seats left, a few students had to seat on the stairs and some people couldn’t even come in and listen to the lecture. People who attended the lecture were mainly students in economy, which was quite expected since the subject was in relation with their field of study. However, everybody should feel concerned with those societal problems. Also a number of adults, probably teachers from the University of Namur, but also from other universities were part of the public. Talking about the conference, the important point that Jared Diamond really insisted on was that the role of the social elite is extremely important for a society, because if the elite suffers from the same problems as everybody, they are motivated to do something to help their society. He gave the example of Holland to illustrate this statement. If the elite don’t react to solve the environmental problems, the sea will keep going up and they will all drown (rich and poor). Personally, I think the conference was really interesting and the speaker was easy to understand. But I know it wasn’t that easy for everybody. I asked, for example, a few students from the Economy Faculty if they could understand him easily, and they answered that they understood maybe a third of his lecture.